US sales of sensors are forecast to climb at a 6.1 percent annual rate through 2016 to $14.9 billion. Process variable sensors will remain the largest category, while chemical property sensors and proximity and positioning sensors will post the fastest growth. Motor vehicles will once again become the leading sensor market as production rebounds from recessionary lows. 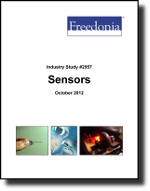 This study analyzes the $11.1 billion US sensors industry. It presents historical demand data for the years 2001, 2006 and 2011, and forecasts for 2016 and 2021 by sensor type (e.g., process variable, physical property, proximity and positioning, chemical property, electrical property, imaging) and market (e.g., industrial, motor vehicles, military/aerospace, electronic, medical, consumer electrical and electronic, information technology). The study also considers market environment factors, details industry structure, evaluates company market share and profiles 40 industry competitors, including Honeywell, Sensata Technologies, and Northrop Grumman.